Customer-owned Greater Bank has made sweeping changes to a variety of its term deposit products. The eight-month term deposit with interest paid at the end of the term now has an interest rate of 2.1% p.a, down from 2.55% p.a. The eight-month term deposit with interest paid monthly now has an interest rate of 2% p.a, down from 2.45% p.a. Rate cuts of 40 basis points were made to Greater Bank’s 10 and 11-month term deposits – these rates now sit between 2.1% p.a. to 2.2% p.a, depending on the interest frequency. Rate changes were also made to other terms, including a few increases. Greater Bank’s three, four and five-year deposit rates were increased by five, 10 and 15 basis points respectively, while its six-month term deposit was increased by 40 basis points. Six months 1.90% p.a. +40 2.30% p.a. Eight months 2.55% p.a. -45 2.10% p.a. Nine months 2.60% p.a. +10 2.50% p.a. 10 months 2.60% p.a. -40 2.20% p.a. 11 months 2.60% p.a. -40 2.20% p.a. Two years 2.80% p.a. -15 2.65% p.a. Three years 2.75% p.a. +5 2.80% p.a. Four years 2.75% p.a. +10 2.85% p.a. Five years 2.75% p.a. +15 2.90% p.a. Greater Bank’s latest term deposit rates remain fairly competitive, but still some way off the highest interest rates on the market. Greater Bank is just one of several institutions to make changes to their term deposit products over the past few weeks and months. The institution joins the likes of Macquarie, UBank, NAB, Commonwealth Bank, ANZ, Heritage Bank and Rabobank, among others, who have changed interest rates recently. In March 2019 alone, 20 institutions have made changes to their term deposit interest rates. While there have been some increases scattered about in the large list of changes, the majority of them are decreases. 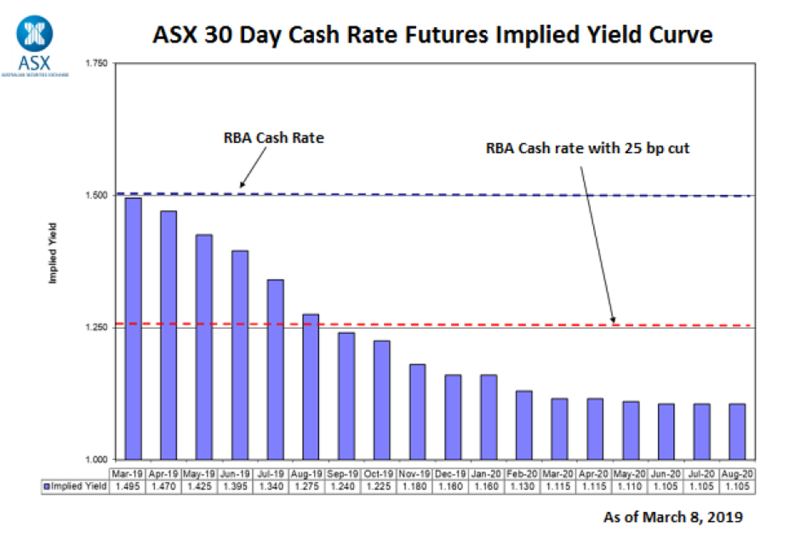 But more rate cuts could be on their way, if recent cash rate forecasts are anything to go by. Our cash rate currently sits at 1.50% – already a record low – yet the likes of NAB, Westpac, Morgan Stanley, UBS, AMP and JP Morgan have all chimed in over the past few weeks and stated the Reserve Bank will cut rates in 2019. According to the ASX, the futures market has also priced in a 25 basis point cut by September 2019. Of course, term deposits rates are fixed, so customers who lock in a good term deposit rate now won’t be affected by rate cuts over their term until it has expired. But when the term does expire, customers will often have their rate rolled over to whatever that term’s new rate is – unless they switch to a new term deposit.